The USB Twinax Kit provides 5250 display and printer emulation and convenient Twinax access to your iSeries AS/400, Advanced/36 and System 36. The USB Twinax Kit is a hardware/software package that provides powerful, flexible local 5250 terminal and printer emulation for any Windows environment. 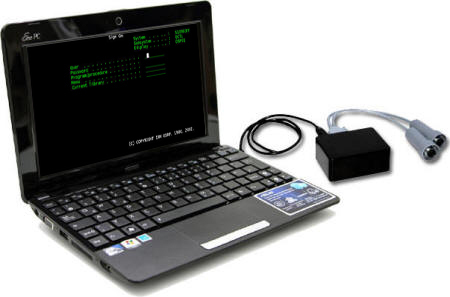 By using a standard USB connection you can connect the PC via Twinax just as you would with a standard Twinax Workstation. 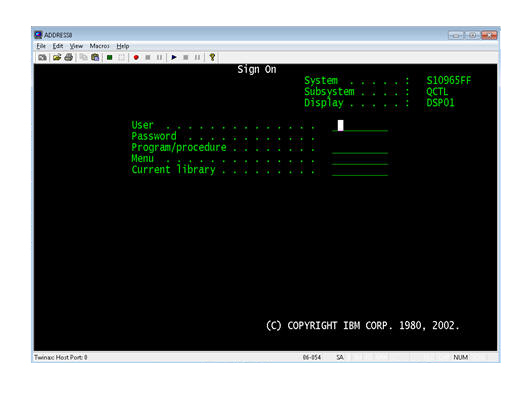 With the included OmniTerm/ES 5250 Emulation Software you can emulate a variety of 5250 terminal types and IBM midrange printers. Because it connects with a USB connection, there is no possibility of any hardware conflicts. Also, you can connect it to any PC, laptop or Thin Client Terminal (with proper operating system) with no need to physically open the unit. In fact, it's a great option to use as a Twinax System Console. You can even access it remotely with programs such as LogMeIn, Team Viewer, Microsoft Remote Desktop, etc. giving you access to your System Console from anywhere. Click here for more information on using the USB Twinax Kit as a Twinax System Console. USB Connection - Connects to PC with a standard USB cable eliminating any internal hardware IRQ configuration headaches. NOTE: Click here for the updated Windows Device Driver for the USB Emulation Kit. Multiple Display/Printer Session Support - A single PC can run up to seven sessions concurrently. iSeries and AS/36 data entry, batch processing, print jobs, and PC resident software can be run simultaneously. Multiple Printer Sessions - Choose from a variety of popular printers supported by the PC. Up to three 5250 printer sessions are supported at any one time, each running independently while another host or PC application is active. ETU file transfer support - ETU (Enhanced Transfer Utility), is an industry standard optional file transfer program for installation on System i, iSeries AS/400, AS/36, and System/36. It allows direct bi-directional file transfer between the IBM Host System and a PC equipped with an NLynx 5250 Emulation product such as ES/PCI, OmniTerm/ES or USB Twinax Emulation Kit. Click here for information on purchasing ETU File Transfer Software. Hotspots identify host menu items - Host menu items and function keys can be assigned colors. Employ this aesthetic and intuitive approach to locate them quickly and easily. Keystroke memory and playback (macros) - Predefine keystrokes for automated sign-on, repetitive data entry, or unattended operation. Store as many as 2,048 keystrokes in up to 24 keyboard macros. Drop-down menu support using mouse button. Keyboard mapping allows easy reconfiguration to support existing keyboards. Advanced printer support includes Autorotate, Autosize and Host Transform functions. Direct-connect or network-attached printers. Custom tool bar allows users to create their own easy-to-use buttons for frequently used items, including macros. OmniTerm/ES: TCP/IP Emulation Software for TN5250e, TN3270e and VT420. Works with Windows 10, Windows 8, Windows 7, Vista, XP and NT4. ES/Server: Low-cost gateway, connecting via Twinax to an IBM Midrange to share seven emulation sessions (per adapter) over an Ethernet or Token Ring LAN.